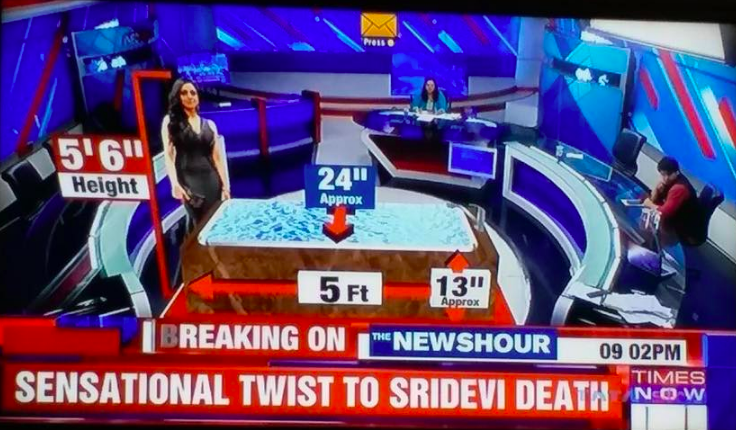 Indian media turns coverage of Sridevi’s death into a grotesque media spectacle. Barely hours after the news of actor Sridevi’s death broke out during the early hours of February 25, speculation over what led to her death drove Indian TV channels to turn it into a grotesque circus, from spinning wild conspiracy theories to scrutinising the state of her marriage. Indian TV channels that were grasping at straws got a second wind after Khaleej Times reported Monday afternoon that the ‘autopsy report’ mentioned ‘accidental drowning’ to be the cause of the death and not a cardiac arrest as was widely believed until then. 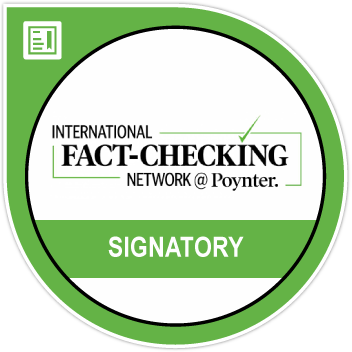 Two UAE based publications Khaleej Times and Gulf News reported the story when details of the actor’s death certificate were released. Khaleej Times first reported at 2:53 pm on Monday. But at 3 pm, Khaleej Times put out further updates which did not mention a cardiac arrest. At 3:19 pm, Khaleej Times ruled out cardiac arrest. At 3:34 pm, Khaleej Times then tweeted the copy of the death certificate which spelt ‘drowning’ as ‘drawning’. Meanwhile, Gulf News had one extra detail not found in the Khaleej Times story till then – traces of alcohol being found in Sridevi’s body that could have contributed to her death. Strangely, the two documents put out on social media which had “accidental drawning” mentioned, did not reveal any details of traces of alcohol in the body. It is not uncommon for anyone attending wedding parties to have traces of alcohol in their blood. Gulf News also had opinions of doctors as well in one of their stories that fuelled the alcohol theory. For the Indian media who have shown the enthusiasm of vultures around a corpse, this was it. The floodgates had opened for what can now be called ‘Bathtub Journalism’. 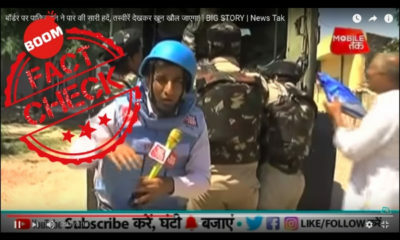 Across the board, English, Hindi news channels and many regional channels had decided this was the most opportune time to display the strength of their technology and graphics firepower. CNN News 18’s Zakka Jacob’s show at 4:22 pm had an interview with Khaleej Times editor with a call-in number mentioned for viewers to call and share their views. 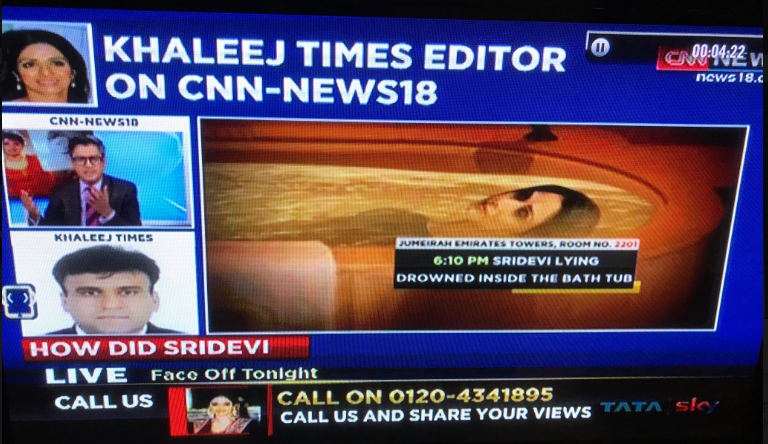 The image on the screen also had a graphic of Sridevi submerged with her head slightly above water. 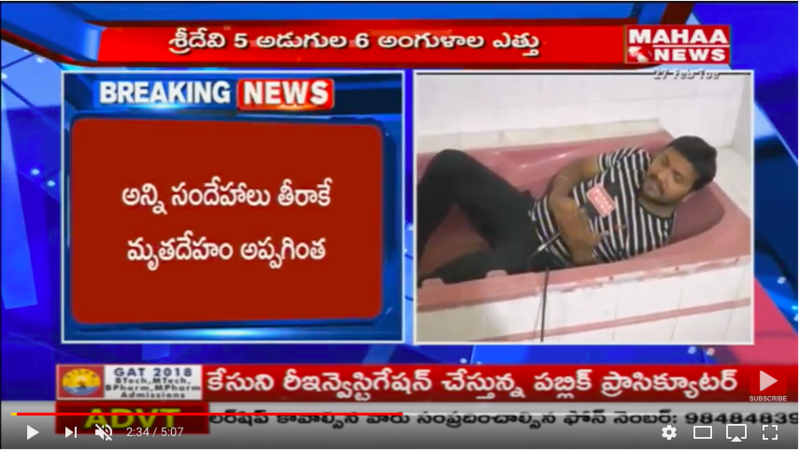 TV9 had a graphic showing husband Boney Kapoor looking over the bathtub with Sridevi lying in. 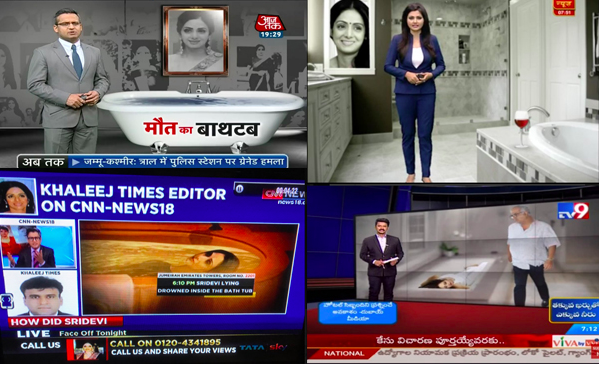 Aaj Tak had an anchor standing in front of a screen with “Maut ka Bathtub” written over the screen and a portrait of Sridevi hanging above it. ABP News decided to move one more step ahead and positioned an anchor in front of a bathtub with a glass of wine placed near a sink. It is not clear where ABP News learnt that Sridevi had consumed alcohol inside the bathroom. Telugu channel Mahaa News decided graphical representation was just not enough. So they sent a reporter to show their viewers what can go wrong in a bathtub. A small consolation was that the reporter decided to spare viewers by enacting the entire scene in a dry bathtub. 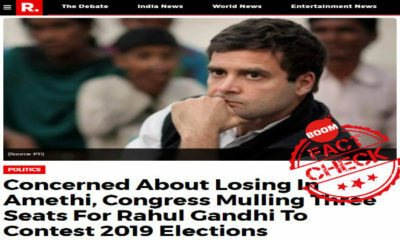 While Navika asked whether the new revelations raises the question of this is no longer an open or shut case, Rahul had several guests on the show ‘India Upfront’ including estranged Congressman Shehzad Poonawala along with Simi Chandoke, an entertainment reporter. Chandoke whose reporting chops is not crime reporting, painted the picture of an actress who was bogged down by her husband’s finances and the pressure surrounding her daughter upcoming debut film. 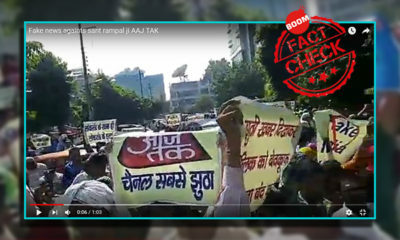 Times Now also literally fanned conspiracy theories on social media. Indian journalists also thought it wise to seek comment from Sridevi’s acquaintances and friends. The now out of favour politician Amar Singh known for his Bollywood connections had this to say about her death. But TV channels gave his quote of Sridevi not drinking ‘hard liquour’ a sinister spin. The non-stop reportage also led Indian TV channels to turn to their favourite dial-a-quote and unofficial top cop- Subramanian Swamy, who is convinced Sridevi’s death involves foul play. The media spectacle in India around Sridevi’s death has not gone unnoticed by foreign press. Khaleej Times had a word of caution for Indian journalists in its ‘Nano Edit’ snippet on its front page. “To the media in India, we advise patience’. A virtue in these trying times’, the paper wrote. At the time of writing this story, Khaleej Times reported that Sridevi’s body was on its way for embalming and that Dubai police had given a clearance letter to family members. The official Twitter handle of the Dubai government tweeted that ‘Dubai Public Prosecution stressed that all regular procedures followed in such cases have been completed’. Dubai Media Office tweeted that the case had now been closed.